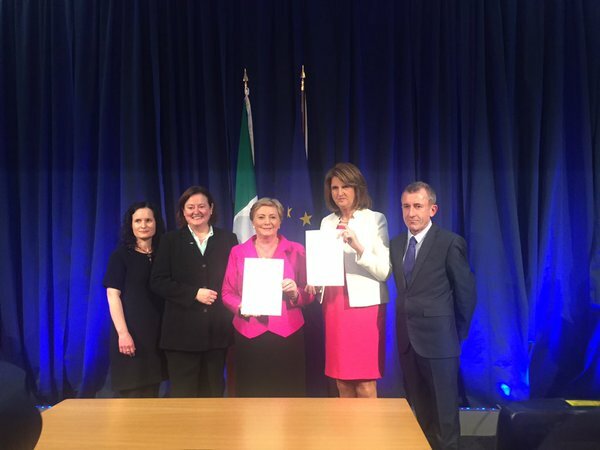 The commencement orders for the Marriage Act and related legislation were signed yesterday evening at 5pm in George’s Hall, Dublin Castle, by the Minister for Justice, Frances Fitzgerald TD and Tánaiste Joan Burton TD. The orders will mean that from next Monday, November 16th, lesbian and gay couples will be able to get married in Ireland. “We celebrate the final legal step in the remarkable Irish journey to equality for lesbian and gay people. From next week lesbian and gay couples will be apply to get married and share in the same constitutional status as every other citizen” said Kieran Rose, GLEN Co-Chair. “It is a truly joyful and historic moment, not just for lesbian and gay people, their families and friends, but for all Irish people. It is the end of a long legal journey that began with decriminalisation in 1993, equality legislation in 1990s, Civil Partnership in 2010 and culminated in the passing of the marriage equality referendum in May. The Tánaiste and Minster Fitzgerald are to be congratulated for the role they have played in that journey As we approach the centenary of 1916 we can celebrate the Irish people’s determination, as shown in the referendum result, to continue to make the words of the proclamation real for all”. “There is further work to be done to ensure that the extraordinary support and goodwill of the Irish people is translated into real change in the daily lives of LGBT people. Together we can create an Ireland where this and future generations of LGBT people can achieve their full potential in school, in work and in wider society on the same basis as all others” said Rose.